Coenzyme Q10 (also known as ubiqinone) is a vitamin-like substance which plays a vital role in the body’s energy supply mechanism, acting in conjunction with enzymes (hence the name coenzyme Q10) to convert sugars and fat into energy. Coenzyme Q10 is also important as an antioxidant within the body. Coenzyme quinones occur in several chemical forms, with coenzyme Q10 being the only form found in human tissues. The human body is able to synthesize (in the liver) a limited amount of coenzyme Q10, with the remainder being obtained from the diet. Rich sources of coenzyme Q10 include fish (mackerel, salmon and sardines) and nuts. Who is most likely to be deficient of Coenzyme Q10? Coenzyme Q10 is an essential cofactor of enzymes involved in the energy production process. Coenzyme Q10 is stored in mitochondria, structures found within cells responsible for the generation of energy (in the form of a molecule called ATP). Tissues with a high-energy requirement (heart, liver, skeletal muscles) contain higher numbers of mitochondria within their cells. 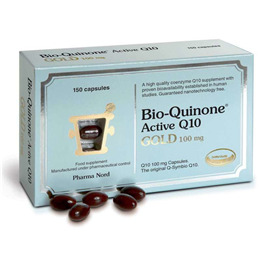 What are the benefits of Bio-Quinone Q10? Coenzyme Q10 is also important within the body as a major fat-soluble antioxidant; protecting cell membranes from the damaging effects of free radicals, in a complementary manner to vitamin E.
Coenzyme Q10 promotes healthy cardiovascular function and healthy immune function (cells involved in immune response have a high energy dependence). Palm Oil (Bulking Agent)*, Fish Gelatine (Capsule Shell), Co-enzyme Q10, Glycerol (Humectant), Ascorbic Acid (Antioxidant), Purified water (Humectant), Silicon dioxide (Thickener), Ammonia Caramel (Colour). 1-4 capsules per day with food, or as directed by a physician. Below are reviews of Pharma Nord Bio-Quinone Q10 Gold - 150 x 100mg Capsules by bodykind customers. If you have tried this product we'd love to hear what you think so please leave a review. This is a very good product which provides me with plenty of daytime energy. Find Q10 of great value not only health wise to myself and my wife but also best price value with Bodykind. 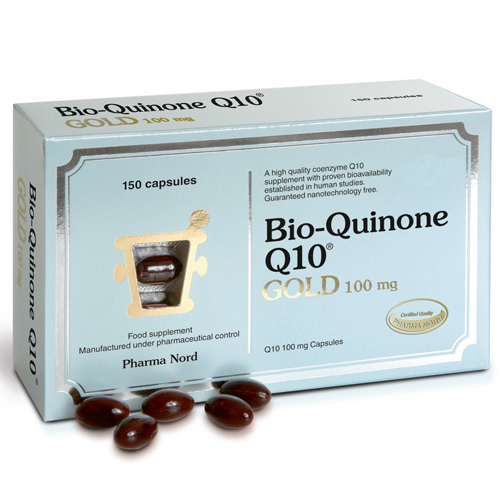 Pharma Nord Bio-Quinone Q10 Gold - 100mg - supplements the diet with Co-Enzyme Q10, which may help in maintaining and supporting a healthy heart and cardiovascular system. As recommended by Dr Chris Steele MBE.